Cherdo on the Flipside: Remove Food Words from Medical Descriptions - Please! Remove Food Words from Medical Descriptions - Please! This topic has been on my mind for years - even back when I was a nurse myself, with Flo Nightingale, it bothered me. It's not limited to nurses, however. Doctors do it. Nurses' aides do it. Publications do it. Before I break into song, someone explain this to me: What possesses people to use food words to describe funky diseases or medical conditions? Actually, I've never seen a big uproar about this, though some might chime in if I mention how distasteful it is (no pun intended). Certain infectious conditions are described as "fishy." Boom. Put down that tuna sandwich forever. The breath of a patient diabetic with a very high blood sugar might be described as "fruity." Ugh, and here I was the only adult who still respected Fruity Pebbles. They're so darn fake-fruity. Now, that is ruined for me. Back to Fiber One. "Cafe-au-lait spots" refer to brownish blotches on the skin, while red hemagiomas, those vascular clusters that form the red birthmarks, are referred to as "strawberry birthmarks." Internal bleeding in your stomach might cause "coffee ground emesis." Now, I'm skipping the Dunkin Donuts coffee for life. Body shapes are apples or pears - although I might be described as the new hybrid apearle shape. It is associated with any bad disorders that might arise from having an apple or pear shape. As if someone shaped like a strip of bacon would be healthier (beware, tanning bed lovers). Might as well confess that I have a melon head, too. 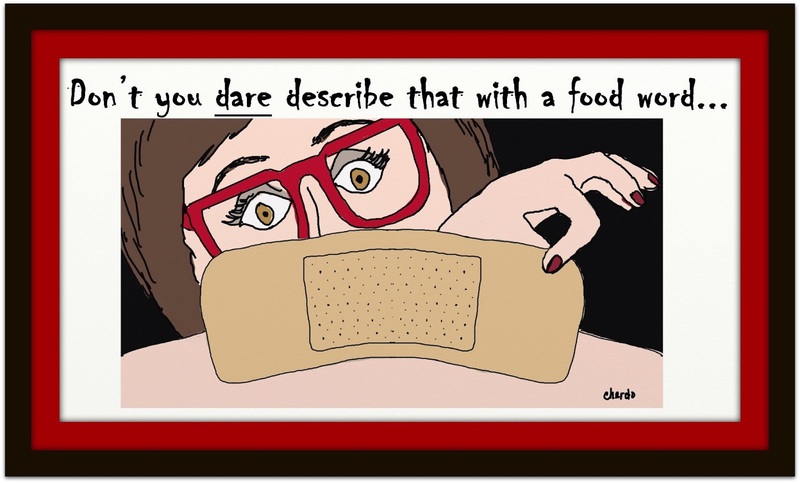 But the worst, absolutely worst, category for the misuse of food words has to be wounds. In that funky environment, you'll see things described as "caked", if there is drainage, some creative writer will say it is "creamy" or "milky"... There goes desserts forever. This could be a new diet. Every time I see terms like that, I have to ask: can't we come up with another adjective? Mr. Webster wrote a whole book of just words and meanings; any phone that can handle an app can download a free dictionary - or better yet, a Thesaurus. I've thought about rebelling against this trend and just taking it over the top by using food terms inappropriately everywhere, and see if I am asked to explain what I really mean. "That guy's ideas are really corndog." "After the party, everyone was all goulashed." "I submitted a report, but the boss said it was flapjack. I syruped back to my department." "The shoes I tried on were sort of Wonka Bar. I was looking for a more Kit Kat vibe." This small protest may cause humanity to change their ways. We've evolved, linguistically, people! Then again, there's nothing that sounds dumber than walking around doing the dumb thing that you thought was dumb enough to deserve a soapbox. Before I abandoned the rebellion, I did call the five grocery baggers, all grouped around the cashier but doing nothing, "a cashew cluster." They just smiled and said "have a nice day, Mrs. M!" Ewww, no. We should not mix foody terms with medical issues. Ha ha ha...we are in the same camp! Good & Plenty morning, dear Cherdo! It's Shady, the Jolly Rancher of blogging sitting here nursing a sore Tootsie Roll. After reading your post I have a sudden craving for fish, strawberries, apples, pears, melons, cake, corndogs, goulash, flapjacks with syrup and a Kit Kat bar. Maybe I'm preggers! I was already familiar with some of these medical food terms because Mrs. Shady came up through the ranks or nursing and I helped her study when she was in nursing school. These days I often hear Mrs. Shady using these food terms in telephone conversations with doctors and nurses on nights she is on call (such as last night). Another term I hear her use is "cabbage" the slang used for the surgical procedure CABG - coronary artery bypass graft. There is also the medical slang Champagne Tap which is accomplished when a bloodless sample of Cerebrospinal fluid is taken during a lumbar puncture and traditionally rewarded with a bottle of bubbly from mentors. Funny coincidence, because Champagne Tap is also the name of the dance school I am currently attending as I prepare for a new career and a bright future as a terpsichorean. Thank you for another great week, dear friend Cherdo, and have a wonderful weekend! That was another good one - I forgot CABG (and I used to do cardiology and respiratory nursing)! If you are, in fact, with child - it is only right that Janie and I give you a baby shower. I'm going to get started on the favors right now, so thanks for the new craft inspiration! I'm going for a neutral color, like yellow. Don't you dare reveal the gender to anyone else. I see a potential blog exclusive here. Shady, my punny brother, please go forth and rock the weekend (or put it in a coma, whatever you need, pal!). If it's a boy, I'm naming him Willy Dunne Wooters. If it's a girl, I think I'll go with Gretchen. I snarked coffee out my nose in honor of Gretchen. You two are insane. My kids always say I'm crazy. They need to meet Cherdo and Shecky. The Hurricane used to date a young man whose last name was Retcher. If she had decided to marry him, I would have demanded that she not take his name and that he change his name because I wasn't going to have any retching in my house. Cherdo, you should known by now that you can't drink or eat anything while reading comments from Shady. And I am not giving that man a baby shower. Gol' darn it, it should be "you should know by now." I hate it that I can't correct comments. UPDATE: I just felt little Gretchen kick! Dang. I have to return all this yellow stuff. Congrats! Do it, Lexa! It totally works there because it sets up that creepy feeling, lol. Great post! I'd never really considered how often we use foodie words to describe semi-disgusting medical conditions. Maybe it's because we're too lazy to come up with new terms? Then again, why should we? I mean, what other phrase is gonna be more descriptive than "cottage cheese" fat? Amen, and my pals have thought of a bunch of others. I used to complain about food words when people charted on patients. Yuck. Having visited the Flipside, you understand how one might not expect that story to come out of me (but it is 100% true). Come back and see me some time! ...Now, why do I find myself remembering Hallowe'en at college, when some person with a rather large beer gut came tearing into the dining room brandishing a knife (this was way, way, way pre 9/11. I think William Tecumseh Sherman was the head of the Joint Chiefs of Staff), leaped up on a table, plunged the knife into his paunch, thrust his hand in and pulled out a fistful of bloody entrails with little dark adhesions peppered here and there.. Most of the harmless, innocent ones were fainting. It took a moment to realize that intestines were generally not that thin and blood not that orange. The creep had opened and poured several cans of spaghetti and meatballs into a plastic bag, stuck the bag under his t-shirt, and gone from there. I was sorry he hadn't stabbed himself in the flesh. Still, it was well done. And now I can't eat spaghetti and meatballs, even the stuff I make, myself, from scratch, without thinking of bloody entrails. That is going too far, which is why I'll probably try it out. I'll sneak into the high school where I taught and traumatize all those brats when they're in the cafeteria. Yuck! I don't think I realized just how often medical conditions are described as food items. That definitely would change my appetite. I'm a magnet for uncomfortable realizations. Well, so much for my tuna salad.